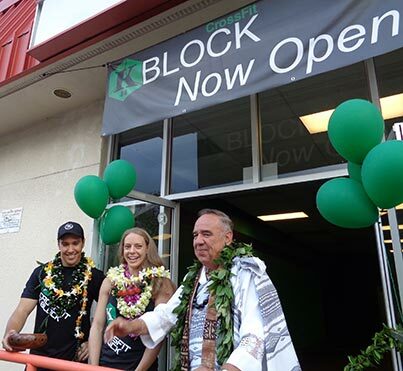 The official grand opening ceremonies for CrossFit KBlock health and fitness center located in the Kāne’ohe Shopping Center was held on April 18, 2015. The festivities started with a traditional Hawaiian blessing performed by Kahu Silva. Assisting Kahu Silva with the pi-kai (water sprinkling purification) ritual and the customary unraveling of the sacred maile lei, were co-owners Sandy Johnson and Kalei Whittle. In accordance with ancient ceremonial protocol, guests attending the occasion were greeted by Kahu with an ‘oli aloha (welcome) chant and made their entrance into the gym facilities with a mele komo (invitational) chant. The program culminated with a pule pane (closing prayer) that included everyone united in a circle of friendship for the purpose of sharing the island “spirit of aloha.” In his closing message to the large gathering, Kahu shared, “that in ancient Hawai’i, health and fitness were considered everyone’s personal responsibility.” In keeping with this Hawaiian philosophy of promoting a healthy lifestyle, Kahu commended the new fitness center for developing a program that is designed for universal scalability in which everyone regardless of age, size, shape and weight can participate. 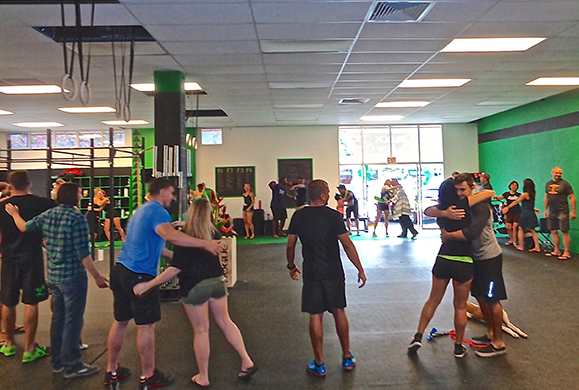 After Kahu extended his congratulations to Sandy and Kalei and offered his best wishes for every success in their new endeavor, everyone was invited to celebrate with a workout party and refreshments.